Ready for a Possible Heat Wave? Monday night: Clear & cool. Upper 40s to mid 50s. Tuesday: Sunny & mild. Mid-70s to near 80. 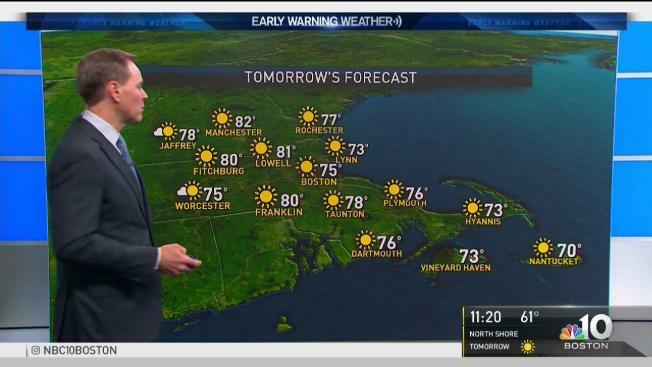 Wednesday: Mostly sunny. Upper 70s to low 80s. High pressure moves in across New England Monday as a cold front that brought a round of damaging storms to eastern Massachusetts overnight pushes offshore. Showers and maybe a few thunderstorms will develop Monday afternoon as an atmospheric disturbance traverses overhead. Any remaining showers will dissipate as the sun sets in the evening. Clouds and cool air will keep parts of Maine and mountains of New Hampshire and Vermont in the upper 60s and lower 70s while southern regions crest into the mid to upper 70s, with a few locations in the Connecticut Valley touching 80 degrees. Mountain valleys dip into the low 40s to upper 30s overnight, upper 40s to mid 50s elsewhere. High pressure centers itself over New England on Tuesday, resulting in abundant sunshine, low humidity and high temperatures in the upper 70s to 80 degrees south and mid 70s across the north -- a perfect early-summers day! The area of high pressure that brought pleasant weather Tuesday will shift offshore by Wednesday, resulting in a return flow from the southwest. This will usher warming temperatures and increasing humidity across the region. An area of low pressure approaching from the Great Lakes will bring the threat of showers during the day but, expecting a mostly dry day for most. Thursday features clouds and rain as low pressure closes in. Due to increased clouds, expecting temperatures to reach into the low to mid 70s across most of New England. Ready for a heat wave? Starting Friday, an area of high pressure will bring very warm temperatures to New England, resulting in a likely heat wave through the weekend with heat indices reaching above 100 degrees. Highs reach into the 90s through the weekend on the exclusive Early Warning Weather 10-Day on NBC10 Boston and necn.